Thank you for visiting RAHMAT SHABAZZ...publishing great live Jazz performances, music, recordings, and written and visual insight into the musical genre. Visit our NEWS AND VIEWS TAB TO SEE OUR LATEST NEWS LETTER...WITH PHOTOS AND MORE! Click our MUSIC TAB and listen to samples from our recording label, and click the TYPICAL SONG LIST sub tab to see some popular favorites in our repertoire. Rahmat Shabazz Trio Plus in the recording studio! What We Do... Jazz At Its Best! Charles Rahmat Woods (Choctaw-Shabazz) has performed with Roy Haynes, Helen Humes, Don Cherry, Jean Paul Bourelly, Tarika Blue, Conjunto Peligro, Bantu, The C. Henry Woods Troupe, and others in the New York, Washington,DC, Maryland, and Virginia areas. Specializing in providing great live Jazz and music for concerts, banquets, weddings, house parties, and businesses, his ensembles have played for a wide range of distinguished clients and dignitaries. His recordings for RAHMAT SHABAZZ have been well received in the US, Europe, and Japan. Charles Rahmat Woods is also a touring artist for the Maryland State Arts Council. Planning an event?...contact us for a free consultation! Click on our PERFORMANCE SCHEDULE button to view more band photos and see when we will be performing near you! 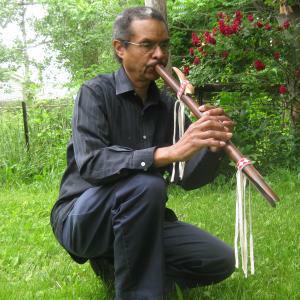 Charles Rahmat Woods (native flute) "Water Bird"